Georg Seelmann was born on 4 February 1917 at Bamberg. Seelmann was posted to JG 77 in autumn 1939. Unteroffizier Seelmann was assigned to 2./JG 77. He gained his first victory on 14 May 1940, during the French campaign, when he shot down a French Morane 406 fighter near Charleroi. During the Battle of Britain, Seelmann claimed at least one RAF Spitfire fighter shot down. On 21 November 1940, 2./JG 77 was redesignated 11./JG 51. Operating over the Eastern front, Seelmann was to be particularly successful. In July 1941, he recorded 17 victories, including his 20th victory on 16 July. Seelmann recorded his 30th victory on 9 August. On 30 August, a Russian bomber rammed Seelmann during aerial combat. He baled out of his stricken Bf 109 F-2 (W.Nr. 9647) landing 16km behind Russian lines. He successfully evaded capture and returned to German lines. Leutnant Seelmann was awarded the Ritterkreuz on 6 October for 37 victories. Seelmann was transferred to Ergänzungsgruppe/JG 51 in mid-December 1941 to undertaking instructional duties. He transferred to Ergänzung-Jagdgruppe Ost on 25 February 1942. On 1 August 1942, Seelmann returned to front line duties, as Staffelkapitän of 11./JG 51, based on the Eastern front. However, on 3 August, Seelmann was shot down by return fire from the Russian bombers he was attacking. He baled out of his burning Bf 109 F-2 (W.Nr. 12652) “White 5” badly wounded. Seelmann was appointed Staffelkapitän of 4./JG 51 on 8 October 1942. In November, he led the unit to the Mediterranean theatre, operating from bases in Tunisia. At the end of March 1943, Seelmann relinquished command of 4./JG 51 due to the after effects of his wounding in August 1942. He was assigned a non-combat role as Staffelkapitän of 1./JG 103 in summer 1943. Seelmann died on 18 September 1989 at Lichtenfels in Oberfranken. 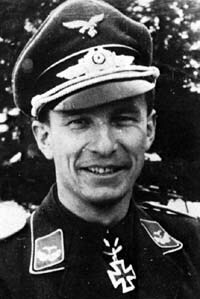 Georg Seelmann was credited with 39 victories in 550 missions. He recorded three victories over the Western front.